Over 100 workers at the GUD Mann + Hummel production plant in Atlantis stand to lose their jobs prior to Christmas as the manufacturing plant closes down. With Christmas looming, more people continue to lose jobs in Atlantis—an area already struggling with high levels of unemployment and concomitant social ills, including gangsterism. The latest company to shut down its production plant in the automotive industry is G.U.D Mann +Hummel (Pty) Ltd – a joint venture between G.U.D. Holdings (Pty) Ltd and a German company. West Cape News has learnt that the company is shutting down its production plant at the end of the year, resulting in the loss of over 100 jobs in an area where unemployment is estimated at 40 percent. G.U.D Mann + Hummel’s closure follows the closure of another automotive industry company and the relocation of a television manufacturing company earlier this year, developments which saw 435 workers losing their jobs, said Jessica Veotte, an organiser at the National Union Metal Workers of South Africa (Numsa) Atlantis branch. G.U.D Mann +Hummel (Pty) Ltd shop steward Gareth Brandt, is a husband and father of three children the youngest three-months old and the eldest eight years old. He has been working for the joint venture for eleven years. 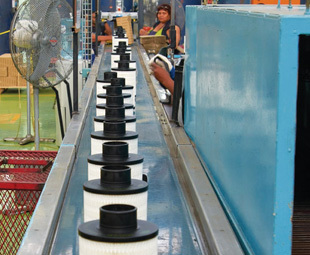 Brandt said G.U.D Mann +Hummel (Pty) Ltd manufacturing plant in Atlantis is shutting down and a component of the business was being relocated to Pietermaritzburg in KwaZulu-Natal. “More than 100 workers are going to be retrenched. Most guys have refused to relocate to Pietermaritzburg. They are quitting, that’s the bottom line. People will rather take their retrenchment package and start all over again or look for other jobs although we know job opportunities here are very rare,” said Brandt. “It (the shutdowns is making our unemployment rate higher,” said Veotte. She said the union tried to convince the company not to shut down the plant but all efforts were in vain. “They (G.U.D Mann + Hummel (Pty) Ltd) say it is not feasible to keep the company open as business in Atlantis is unsustainable,” she said. Group Legal and Human Resources Director at G.U.D. Holdings (Pty) Ltd, Anthony Trickey confirmed that the joint venture was indeed shutting down its plant in Atlantis.